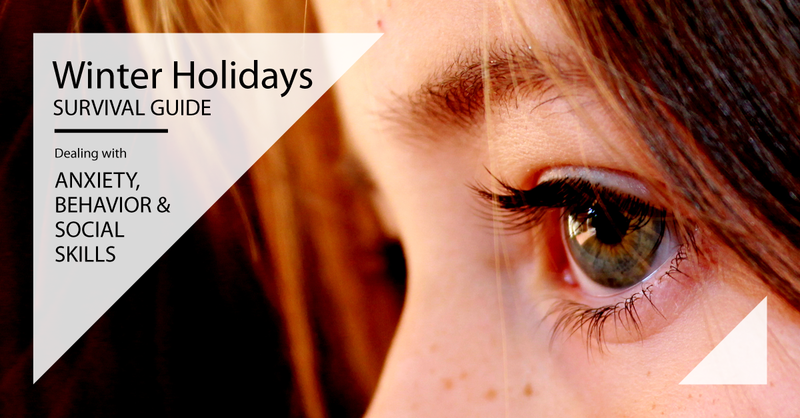 Anxiety issues and behavior challenges are some of the most common struggles families face during the holiday season. Even typically developing children can become overwhelmed with the change in routine, overwhelming sensory inputs and social demands placed upon them at this time of year. But for a child who already faces anxiety issues, struggles with behavior or who does not have the social skills to respond appropriately in a confusing environment, the challenges can be extremely hard. Create Safe Spaces and Scheduled/Structured Breaks: Providing a safe space and scheduled breaks can provide children who struggle to control behavior with a place and time to let go. A "safe space" can be as simple as providing access to a unused bedroom that has been set up with lower lighting, a favorite video game, or other quiet activities. By planning ahead and making the child aware that this space is available whenever he or she needs it, you can prevent anxiety or sensory overload. Empower Friends and Family with Information: Many family members and friends really want to be part of your child's holidays. Provide information ahead of time (for example, "Kate really struggles with loud noises, so please don't be upset if she complains that the TV is too loud." or "Tommy is really into Ninja Turtles this year. His favorite is Raphael and he'd love to talk with you about that.") so that family and friends know what to expect and so that they can help make the effort to connect with your child. For more ideas on how friends and family can be involved in your child's holidays, see Winter Holidays: Acts of Kindness that Make a Difference. Reduce or Remove Anxiety Triggers: Most families are aware of their child's anxiety triggers. By thinking ahead and removing triggers wherever possible, you can make the holidays more comfortable for a child. Examples include making gift-giving predictable (like this) and giving advanced information for events and social interactions (see scripts and schedules above). Prepare Scripts and Role Play: Preparing scripts that children can use ahead of time (like these) and then role playing while using the scripts can help reduce anxiety in social exchanges. Use Schedules: Visual and written schedules (like this one) can help children to predict what will happen next and reduce anxiety related to unexpected situations. This article provides tips for setting up and using your own schedule. Use Social Stories: These short stories identify a specific situation and teach the appropriate way to behave in that situation. There are social stories about Thanksgiving, for receiving gifts (like this one), and even visiting family and Santa (like these). A lot of behavior issues are actually sensory issues in disguise (for example the child who screams and runs away from Great Aunt Mary's hug may not be able to handle her perfume). For more information, see the Winter Holidays: Sensory Challenges page.